Book cheap flights to Dar Es Salaam through Brightsun Travel. Call 0124 416 3000 now! Dar Es Salaam is the largest city in Tanzania that boasts an array of breathtaking landscapes, from mesmerizing waterfalls to dense forests and beaches with crystal-clear waters, as well as an amazing music scene and boundless cultural charm. The African, Indian and Arabic influences in this dynamic city have definitely given it an eclectic vibe. 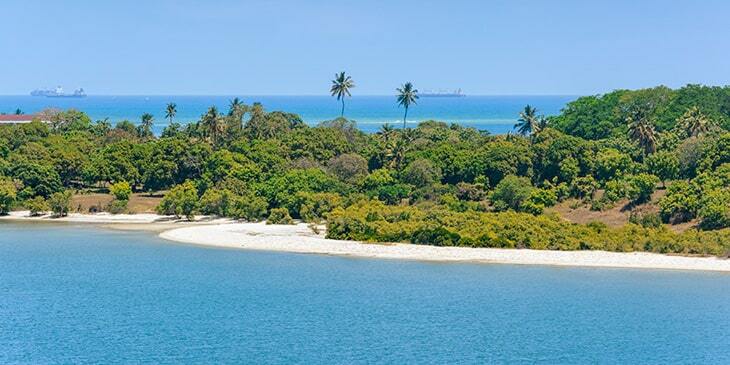 Dar Es Salaam is also brimming with lots of activities; you can go camping on Mikardi Beach, hiking in the Udzungwa Mountains National Park and snorkelling at Mbudya Island, or perhaps embark on a once-in-a-lifetime safari at Serengeti National Park to spot the likes of rich wildlife including aardvarks, black rhinos, impalas and African leopards. Brightsun Travel offers Dar Es Salaam flights from India with world-famous airlines, taking you to the heart of this fantastic city. There are lots of intriguing museums and art galleries in Dar Es Salaam that are worth exploring, including the National Museum of Tanzania where you can learn about the city’s local cultures and discover a range of intriguing items, from statues and wood carvings to musical instruments related to the German and British colonial periods; you can also admire a rare collection of vintage cars here used by British King George V. Another prominent museum in Dar Es Salaam is the open-air Village Museum, home to various Tanzanian traditional huts furnished with pots, pitchers and handicrafts. Finally, don’t forget to visit the Dar Es Salaam Centre for Architectural Heritage gallery to admire a variety of excellent paintings and photographs, showcasing the lifestyle of Swahili people. Dar Es Salaam boasts lots of historic architectural marvels. The most remarkable among them is the Roman Catholic St. Joseph’s Cathedral, constructed by German missionaries with Gothic-style architecture. Another captivating tourist spot in Dar Es Salaam is the Askari Monument, a commanding tribute to Tanzanian soldiers killed in World War I. This iconic building features a bronze statue of a former soldier. You can also step inside the 19th century Azania Front Lutheran Church to admire its red-tiled roof, window canopies and gothic architectural styles. Finally, make sure you visit the historic site of Kunduchi to discover the incredible remains of a 15th century mosque and 18th century tombs. Brightsun Travel offers Dar Es Salaam cheap flight deals, allowing you to come and explore its stunning ancient sites.